Our association is broadly known for maintaining the quality in offering Aluminum Enclosure. We are involve in manufacturing Aluminium Frame Enclosure. Backed by the sound experience of this industry, we have been able to offer an unmatchable assortment of Aluminium Enclosure. 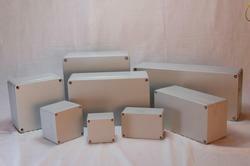 By keeping track with the modern trends, we are bringing forward an extensive range of Aluminium Standard Enclosure Box. This product can be availed for our patrons at market leading prices. The stations are offered in standard cast aluminum enclosures, which are dust and watertight and conform to IP 65 (IEC) and Nema 4X, 12 (UL) level of protection. 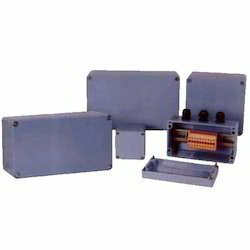 The stations are available in which various sizes and can be assembled with different types of actuators, with / without terminals, with / without ammeters etc. The stations can be painted with epoxy / enamel paints or powder coated. - different size with suitable length of extruded aluminium enclosures are provided for indoor desktop device or outdoor wall mounting junction/control box use . - DIY Aluminum PCB Instrument Box Enclosure Electronic Project Case 100*76*35mm.